This summer we are trying to get outside as much as we can. My children are still young so I can’t really “send them out to play” just yet. When we want to get outside for some fun in the sun, it’s a family affair. Thankfully, after a string of rainy days, we have had some great weather to get out and play. Sometimes it’s as simple as going into the front yard and playing with chalk or bubbles. Other times we pack up a bag and head to the sand box at the airport or for a swim at the local pool. Right now, the challenge is getting my four year old excited about our plans. He loves to play games on our tablets and sometimes it can be difficult to get him to change gears. The good news is once he is involved in the new activity, he has a great time! Know any other kids like that? I am excited to be included in a team of authors partnering with the National Wildlife Federation to write an ebook all about getting outdoors! I have been asked to contribute ideas about “Balancing Screen Time and Green Time”. 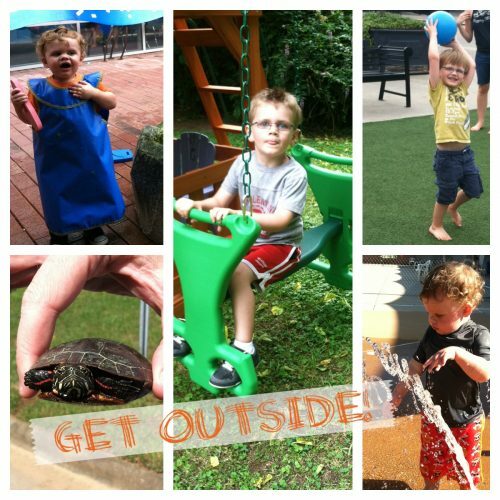 I’ll be sharing how you can use technology and gadgets to encourage kids to spend time outdoors. You can read more about NWF’s Be Out There initiative here and follow the project on Twitter with the hashtag #BeOutThere. This is where you come in! Would you like your idea to be included in this book? Leave me a comment with how you balance technology and nature and you will be credited in the book if your tip is used! There are some really great bloggers contributing to this book and I can’t wait to see the finished product. It’s going to be packed full of useful information! *** I am happy to be a participating author in this crowd sourced ebook sponsored through The Motherhood and the National Wildlidfe Federation. I can’t wait to see how it turns out!